Culturally safe healthcare is rapidly challenging previous notions of cultural competency or cultural sensitivity in healthcare provision. The increasing number of vulnerable populations means healthcare must be given by a healthcare provider who has developed a social consciousness in relation to his or her own socio-cultural positioning versus that of the patient. A culturally safe practitioner has engaged in an active examination of the power differences existing in this patient-provider relationship. 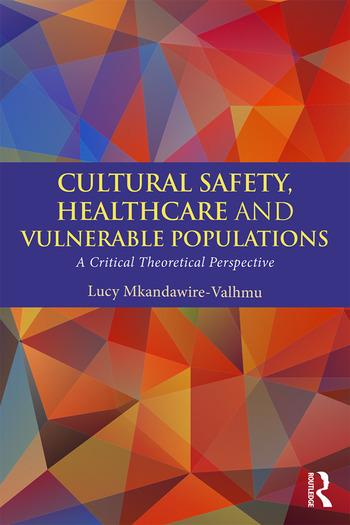 In this book, Lucy Mkandawire-Valhmu critically analyzes the complex issues affecting the health of vulnerable populations. Written from a critical theoretical perspective she seeks to enhance the ability of the healthcare student to develop a social consciousness about the realities faced by many populations living on the margins of society, and thereafter make an active and conscious decision to engage in culturally safe healthcare and contribute to the elimination of health disparities. Through the application of postcolonial feminist theory this book conceptualizes health as being historically situated in social relations of power and emphasizes health interventions that are potentially empowering, and enhance emancipatory change. Through discussions of health provision for ethnic minorities, immigrant populations, and refugees, the book seeks to provide pragmatic guidance for culturally safe care for a variety of marginalized populations and invites students and professionals to think deeply about the implications of power, culture and health. Lucy Mkandawire-Valhmu is Associate Professor in the College of Nursing at the University of Wisconsin-Milwaukee, USA.